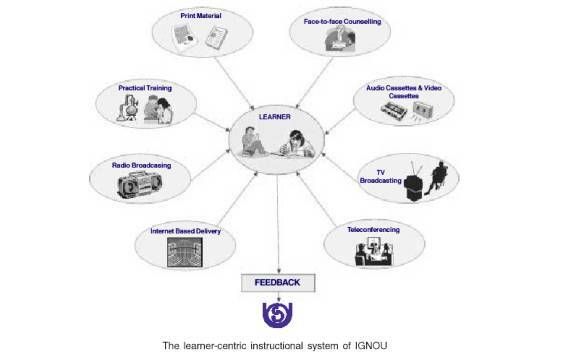 IGNOU's method of instruction differs radically from that of other conventional universities. Indira Gandhi National Open University has adopted a multimedia approach to instruction. The different components being: self-instructional materials, counselling sessions, both face-to-face and via teleconferencing mode. For courses in Science, Computers, Nursing as well as Engineering and Technology, arrangements have been made to enable students undertake practical classes at select study centres. In the tradition of Open Learning, IGNOU provides considerable flexibility in entry qualification, place, pace and duration of study to students. A Bachelor's Degree Programme (i.e. BA/BCom/BSc) of three years duration can be completed in six years if the student so desires. IGNOU follows a credit system that is based on the time factor involved in studying. One credit is equivalent to 30 study hours inclusive of all learning activities. Different programmes have different credit requirements. Students have the right to collect credits at their own pace, convenience and according to their own capability. IGNOU also provides a credit transfer facility whereby credits may be transferred from any other University to IGNOU after fulfilling the necessary requirements.